2019 ACC tournament preview, predictions: Can the ACC land 3 No. 1 seeds? The 2019 ACC tournament tips off Tuesday, March 12 at the Spectrum Center in Charlotte. Below is an in-depth look at the tournament, including a complete bracket, TV schedule, analysis and predictions. 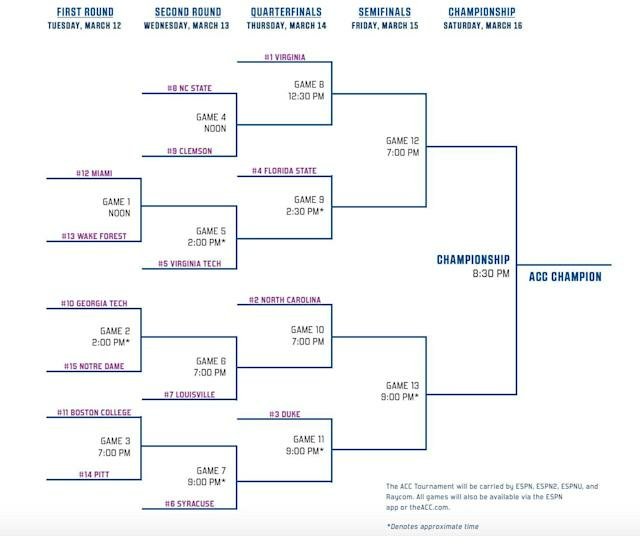 A printable 2019 ACC tournament bracket can be found here. Virginia. The Cavaliers tied North Carolina atop the league, but won a tiebreaker by virtue of beating the Tar Heels in Chapel Hill in February. Their reward is the No. 1 seed and avoiding facing UNC or a Duke team that beat them twice until a potential championship matchup. The Cavs are their usual juggernaut selves on defense — boasting the nation’s third-ranked defense in terms of efficiency — while equally capable of turning it up on offense. Just ask Syracuse, which watched Virginia sink 18-of-25 3-pointers while scoring 47 points in the second half of a 79-53 win last week. Virginia’s only two losses this season came against the Blue Devils. It will take a significant upset to keep Virginia out of Saturday’s final. North Carolina and Duke, of course. The rivals are on track for a potential third matchup in Friday’s semifinal round if they can escape upset in Thursday’s quarterfinals. The biggest question here — let’s be real, anywhere in college hoops — will be the status of Zion Williamson. Duke coach Mike Krzyzewski was optimistic after Saturday’s regular-season finale that Williamson will be ready to go on Thursday. 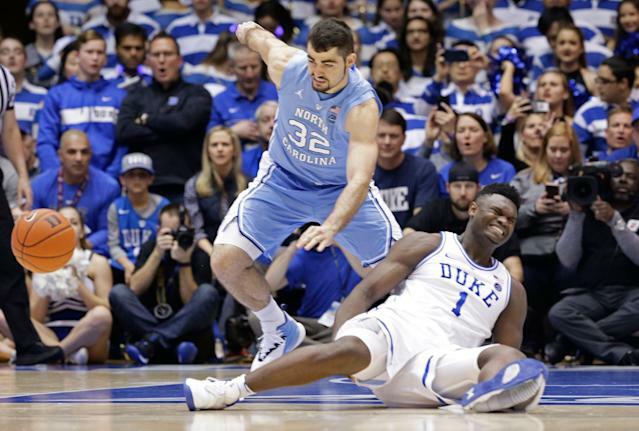 If Williamson returns, there’s the potential of finally getting the full-force UNC-Duke matchup college basketball was deprived of when his Nike busted at the seams in the opening minute of their matchup in Durham. If he doesn’t, UNC has the clear edge and the best shot at upending Virginia for the tournament title. Either way, they’ll likely have to get through each other first before facing the Cavaliers, making the road that much tougher. Florida State, Virginia Tech, Louisville and Syracuse are all capable of pulling off an upset. But asking them to do so multiple times in Charlotte is a tall task. Clemson and N.C. State may be playing for their respective NCAA tournament lives when they face off Wednesday in the tournament’s 8-9 matchup. N.C. State (21-10, 9-9, KenPom 31, NET 32): The Wolfpack stumbled down the stretch, losing three of their last six including an ugly loss to a bad Georgia Tech team to close out their home schedule. Their non-conference slate is not helping their cause, and they failed to beat any of the ACC powers in conference play. They need some wins in Charlotte. Clemson (19-12, 9-9, KenPom 28, NET 35): Clemson avoided the Georgia Tech disaster N.C. State suffered when it eked out a 64-62 road last week win over a Notre Dame team that finished 3-15 in ACC play. Still, not a good look. A win over Virginia Tech helps its cause, but multiple wins in Charlotte will go a long way toward Clemson’s March hopes. Zion Williamson, F, Duke: Will he or won’t he play, and how will he look if he does? It’s the story of the ACC and NCAA tournament. Coby White, PG, North Carolina: A 6-foot-5 scoring point guard who can put the ball on the floor and shoot from deep, White is one of the tournament’s biggest scoring threats. Carolina’s chances may rest on how effective its freshman floor leader is. De'Andre Hunter, F Virginia: The potential lottery pick has come to define Tony Bennett’s way of basketball at Virginia as an elite wing defender who can make teams pay on the other end with his 3-point accuracy. The sophomore who spurned the NBA after last year’s stunning NCAA tournament exit has improved his distance shooting from 38.2 percent as a freshman to 48.6 percent this season. That three-and-D ability makes him a coveted NBA prospect and one of the the ACC’s most dangerous players. Can the ACC land three No. 1 seeds for the NCAA tournament? Duke swept Virginia. North Carolina swept Duke with the benefit of Williamson missing both games. Virginia beat North Carolina on the road in their only matchup. The ACC powers have 12 combined losses, and five of them came in games played against each other. Virginia is a lock for a No. 1 seed, and if Duke beats UNC in Charlotte, the selection committee will be faced with a difficult decision. That decision could end up being three No. 1 seeds coming from the same conference.